London Green Left Blog: Would an Anti-Tory government really be a Coalition of Chaos? Would an Anti-Tory government really be a Coalition of Chaos? At Prime Minister’s Questions on Wednesday in Parliament, every question from the Labour leader, went unanswered by Theresa May, the Prime Minister. Instead, she repeated campaign slogans, especially ‘strong and stable government,’ over and over again. She is not a quick thinker on her feet, and finds it difficult to respond properly to unexpected questions, which is why she is refusing to take part in televised debates, which have become de rigueur in recent general elections. What the Tories are trying to do is frame the debate around the fact they are the only party likely to gain an overall majority in Parliament, at this election, and that Labour would need to form a coalition of at least three parties, probably more, to be able to form a government. This worked well two years ago at the last general election, when they managed to worry English voters with the prospect of Labour needing to rely on the Scottish National Party (SNP), to form a government. This was graphically illustrated by the poster showing Ed Miliband, the Labour leader at the time, tucked away in the then SNP leader, Alex Salmond’s, top pocket. So, this is a tried and trusted tactic, and the Tories have rehired Lynton Crosby who masterminded their successful 2015 campaign. They appear to be broadening this out this time to include the Lib Dems, Plaid Cymru, the Northern Irish SDLP and the Greens, to make the prospect seem even more ‘chaotic.’ The Lib Dems sensibly, have ruled out a coalition with either Labour, or the Tories, so this may reassure voters to some extent, but the British tend not to like the idea of coalition governments, especially such a multi-party one. The Tories themselves, of course, entered into a coalition with the Lib Dems in 2010, because they were short of an overall majority, but with just the Lib Dems as partners, and it was briefly popular. The Lib Dems were routed in 2015, by the Tories in the main, so the coalition in the end was not popular. The British electoral system, first past the post, as it is known, makes for a clear winner more than in other countries which have a proportional electoral system, although over recent years, the number of voters that the big two parties, Labour and the Tories, can command has gradually got less and less of the share of the vote. So this may be changing a little on some levels, but I still think coalitions are something of an anathema to most British voters. The point Cable is making is that a coalition government is unlikely, and not really the aim of tactical voting, but reducing the size of the Tory government, in what is a special election, centred mainly around the issue of Brexit. I watched BBC TV Question Time last night with interest, and when they discussed tactical voting and coalitions, the audience didn’t seem to be phased by this, judging by the applause for points raised in favour. This was in Oxford, so may not be representative of the country at large, but even so, I was taken a little by surprise by the reaction. If the opposition parties did achieve a majority, which is not impossible I think, I see no reason why a ‘progressive’ coalition could not be formed, and there is no inherent reason why this needs to be either chaotic or unstable, since there is plenty that these parties can agree on, enough for a full Parliamentary term at least. It will depend on how the numbers add up, of course. 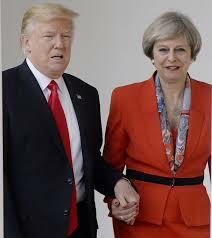 Perhaps someone should knock up a meme (I don’t have the skills for it) showing Theresa May in Donald Trump’s top pocket? Now that would be a powerful image of what this election is all about. I suppose we could say that the lower the Conservative majority, the 'rockier the ride' through Parliament of some of their legislation. I commend reading of the last two paragraphs of the Community Care report Children and Social Work Act 2017: social work reforms become law. Spin and changing the context of statistics is of increasing importance in politics. When John Hutton was Labour's Work & Pensions Secretary, he ignored the factor of fuel poverty as a contributory factor when saying, "After two years on Incapacity Benefit you are more likely to retire or die than get another job." At the time, over-60's in work such as Hariet Harman got winter fuel payments; under-60's on Incapacity Benefit who did not have employers' premises heated at others' expense were more likely to die young. I believe it very important for smaller parties such as Green Party of England & Wales to engage more marginalised groupings such as jobcentre users, especially before those jobcentres are closed in the name of 'improving the service'. I would argue that after two years on a Claimant Commitment — if a Jobseekers Allowance claimant survives that long without being sanctioned into eventual eviction, or a Universal Credit claimant does not get evicted before receiving their first payment of Universal Credit — one is more likely not to vote or to vote for whatever political party dares to engage with them outside the jobcentre. Meanwhile, is the NSPCC colluding with turning the children of paupers into adoption fodder? I would argue that the Conservative Party in Government has a very covert agenda.